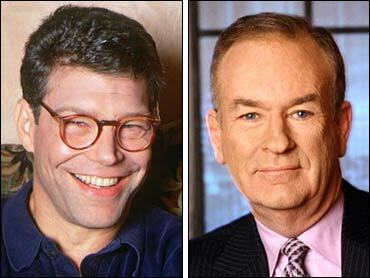 Book conventions aren't usually known for name-calling, shouting and raucous cheers — but that's because most don't feature conservative talk show host Bill O'Reilly and liberal funnyman Al Franken. The one at the Los Angeles Convention Center on Saturday did, and it led to some verbal fireworks in which Franken accused O'Reilly of lying and the talk show host yelled at the comedian to "Shut up." The two men were members of a panel called "MediaTalk" at Book Expo America, an annual gathering that promotes new books. Franken was pitching his new work, "LIES and the Lying Liars Who Tell Them: A Fair And Balanced Look at the Right," while O'Reilly was talking up his "Who's Looking Out For You?" They were joined by conservative CNN host Tucker Carlson and liberal columnist Molly Ivins on the panel, which was hosted by former Democratic Congresswoman Patricia Schroeder, the president of the Association of American Publishers. Franken's book explores the allegation that the media has a liberal bias, one he disputes. The cover displays a picture of O'Reilly, and Franken said he wanted to explain why the Fox News figure was shown. Franken said O'Reilly claimed in a C-SPAN interview that the show he once anchored, Inside Edition, had won a Peabody award. It never did, but won a Polk award instead. O'Reilly was quoted on three other occasions making a similar claim, Franken alleged. When Franken finished, O'Reilly said he had spoken past the 15-minute limit and called him an "idiot." ''This idiot has been going on for 35 minutes,'' O'Reilly said. ''Bill, this isn't your show,'' Franken replied. When Franken tried to interrupt him, O'Reilly told him to "Shut up." According to USA Today, O'Reilly claimed before the panel his photo was used without permission and said later that Fox lawyers would "handle this." Franken claimed it is in the public domain. Franken is the author of "Rush Limbaugh is a Big Fat Idiot" and other titles. O'Reilly has previously inked "The O'Reilly Factor", and "The No Spin Zone."